The Latin cross, with an elongated shaft and a shorter cross bar, is – in essence – unbalanced. It is therefore, associated with the idea of inequality. This instability is connected with such human fictions like power, progress and/or change. The Greek cross and its aim of equality (in a four-fold division) could be interpreted, in a psychological setting, as a symbol of the second part of the Second Quadrant (II, 2). The Latin cross – as an idea – is situated in the third part of the Second Quadrant (II, 3). These different positions are subsequently – in the architectural-visible world noted as signs: the former as representing the essence of the Second Quadrant and the latter as a manifestation of the Third Quadrant. 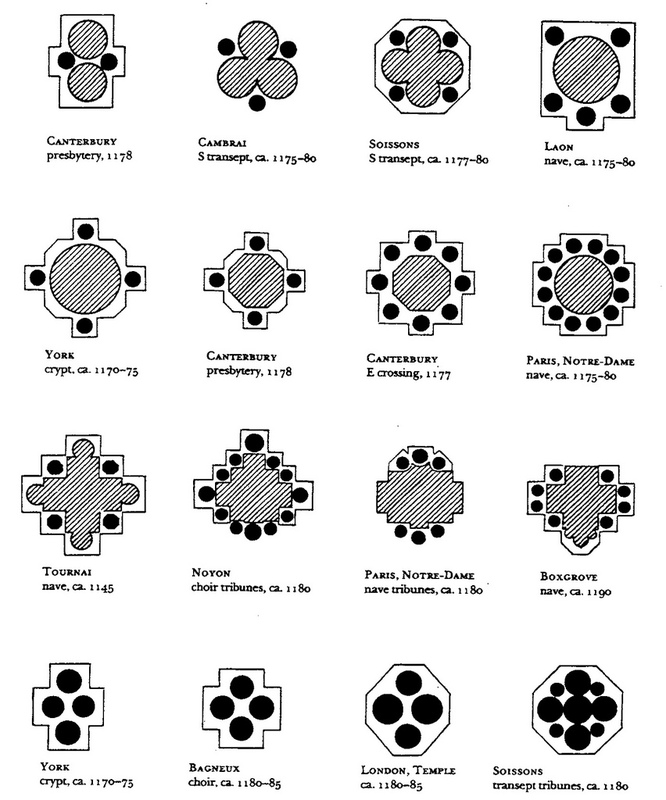 It is not surprising, for this very reason, that the order of the Cistercians – which can be qualified as the earliest Church capitalists – choose for just the design of the Latin cross as the ground plan for their churches (fig. 219). Most Cistercian abbeys in England and the continent have the elongated cross as an architectural ground plan (LAWRENCE, 1984). Fig. 219 – The plan of the Roche Abbey, near Sheffield in Yorkshire (England), is typical for a Cistercian monastery. The abbey was founded in 1147, some fifty years for the beginning of the Third Quadrant of the European cultural history (1200). The first wave of Cistercian settlement in the north of England took place at the beginning of the twelfth century with Fountains Abbey as a major centre. The layout of the monastic buildings of the Cistercians was derived from the classical plan of Benedictine monasteries. Housing was situated on the south side of the abbey church around a quadrilateral. The cloister garth was a central point. The Latin Cross-type ground plan of churches found its way to many similar Gothic cathedrals all over Europe, up to such late examples as the Uppsala Cathedral in Sweden (fig. 220). The bulk of them, however, was built in a relative short time span, starting in the latter half of the twelfth century and lasting to the end of the thirteenth century. Fig. 220 – The building of the cathedral of Uppsala (Sweden) started in 1287 and inauguration took place in 1435 (still not finished). This formalistic example represents one of the many varieties of ground plans, based on the Latin cross. The grave of the Carolus Linnaeus (1707 – 1778) is located on the cemetery of the cathedral. Part of this distinct period in the European cultural history was typified by the classical work of Charles H. HASKINS (1927) as the ‘Renaissance of the Twelfth Century’. The term refers to the similarities with the Italian Renaissance of the fifteenth century. A change in the mental configuration of the population was one of the main characteristics of the ‘Renaissance’, the enormous upsurge in building activities was another. Two important architectural styles are associated with the period of change around the year 1200 AD: the Romanesque and the Gothic style. The former had its greatest expression between 1000 and 1200 (PEVSNER, 1943). The boundaries are difficult to draw. SALET (1968) placed, after careful consideration, the beginning of the Roman(esque) period in the year 1000. The end of the Romanesque style period – and the beginning of the Gothic style – is even more difficult to establish. The ‘round’ and ‘lancet’ shape of the arches is often indicated as typical representatives of respectively the ‘Roman’ and ‘Gothic’ style, but these features are at scrutiny often more confusing than indicative. The choice of the year 1200 as the theoretical boundary between the two types of architectural styles should be seen as just a rough historical marker and treated as such. 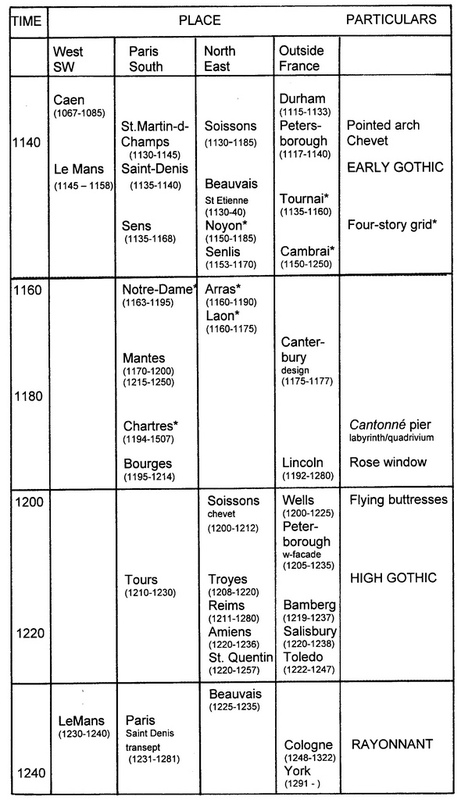 Jean BONY (1983) gave, in his inspiring book ‘French Gothic Architecture of the 12th & 13th Centuries’, a detailed description of the architectonic achievements of that crucial era between 1140 and 1240 AD. It was here, at this point in time and place, that Europe created its most eminent token of identity and laid down a statement of its historical aspiration. Most of the churches and cathedrals are still standing today to testify of the unique inspiration in which (Christian) ideals were literally taking shape (fig. 221). Fig. 221 – The west elevation of the Cathedral St Etienne of Auxerre is an example of the various types of divisions, which attract the eye of the observer. Rob KRIER (1988) gives a proportional analysis of this picture based on the quadripartite division of a circle, but many more lines and/or divisions can be suggested. Signs of the two-, three-, four- and five-division stake their claim to influence the view of the onlooker, but none of them can be considered to be dominant. This given fact, which holds for the elevations of most cathedrals, implies that efforts to discover premeditated geometrical elements in the facade of cathedrals are not convincing. It all started with the new approach to spaciousness and the expansion of width. Saint-Martin-des-Champs (in Paris) was one of the first examples of a Gothic chevet, a space created by enlarging of the ambulatory and aisles. The church was built between ca. 1130 and 1145. Before that time only the nave was enlarged, while the ambulatory (at the eastern end) remained untouched. The five-aisled plan of the early Christian period had seen a revival in Italy at the end of the tenth century, with a further development in the eleventh century by the construction of the Pisa Cathedral and of Cluny III. However, now the intentions were searching for new directions. A protocol for the coming changes could be seen in the church of Saint-Denis (Paris), designed at Abbot Suger’s request in 1140. Firstly, a circular, monolithic column was chosen as a form of support, bringing in a sense of uninterrupted space. Elsewhere (in France and England) the supporting system used a variety of piers with detached shafts (fig. 222). The circular type of Gothic pier was in general use at least until the end of the twelfth century, when the new type of ‘quartered’ column (the cantonné pier) was introduced in Chartres. Fig. 222 – Early examples of piers with detached shafts follow, in general, a tetradic concept with many variations (from the second half of the twelfth century). The circular, monolithic piers of Saint Denis (Paris) pressed – at the same time – for further simplicity. Secondly, the choir was larger and more spacious with the peripheral area of ambulatories and chapels at the same level. A new style of linearity was developed in a stereometric system, using all types of division and certainly no preference for the four-fold. 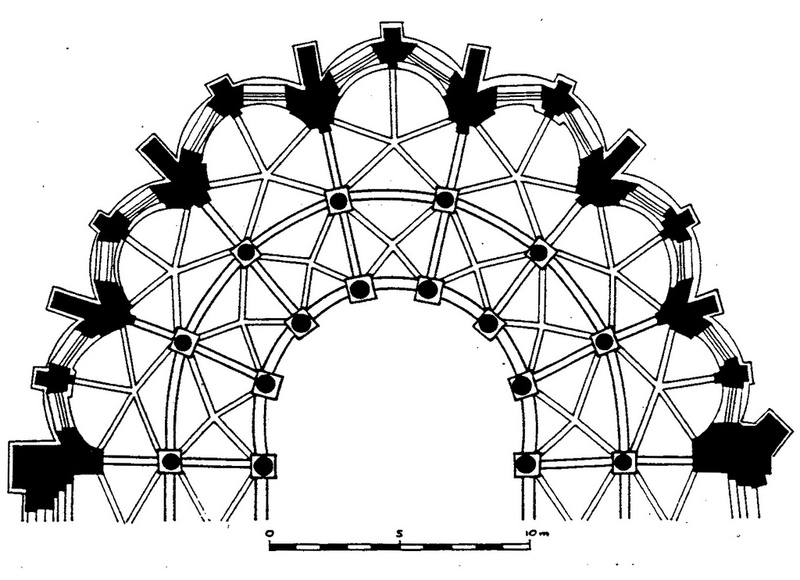 A five-aisled interior (to create space) was a reminder to the early Christian churches and the ambulatory vaults were either four fold (inner circle) or five fold (outer circle) (fig. 223). Fig. 223 – A plan of the ambulatory vaults in the Saint Denis Cathedral (Paris), built between 1140 and 1144. The modular system in a double ambulatory indicates a natural transgression from the four to five-fold. At present, only the lower story of main arcade and aisles remained of the twelfth century structure of Saint-Denis, the upper stories of the choir vanished entirely in the thirteenth-century rebuilding. The church of Saint-Denis was, according to Jean BONY (1983) ‘the most decisive creation of its age’, with a distinct architectural order and lightness of its linearity. The Chartres Cathedral, eighty kilometers southwest of Paris, is probably the most typical of the new composition. The facade with two towers was originally designed in 1145. A fire in 1194 caused a rethinking and rebuilding of the structure. It is clear from looking at the reconstruction of the original design (fig. 224) that the four-fold is virtually absent. The two- and three-division are most prominent on a first glance of the west face of the building (with its three entrances). It was only in the later additions – like the famous Christ in Majesty, depicting the Four Evangelists above the central door and the rose window (constructed between 1205 – 1210) that four-fold symbolism was visualized. The famous labyrinth (Chartres-type), associated with the tetradic-circular, has been dated from the early thirteenth century. The nave and choir were completed in 1220 and the transept ends (the proper Latin-cross ground plan) were finished ca. 1235. Therefore, Chartres’ dedication to the ‘Platonic’ (and ideas about the four-fold) became only visible after the year 1200 AD, i.e. in the Third Quadrant (III) of the European cultural history. Fig. 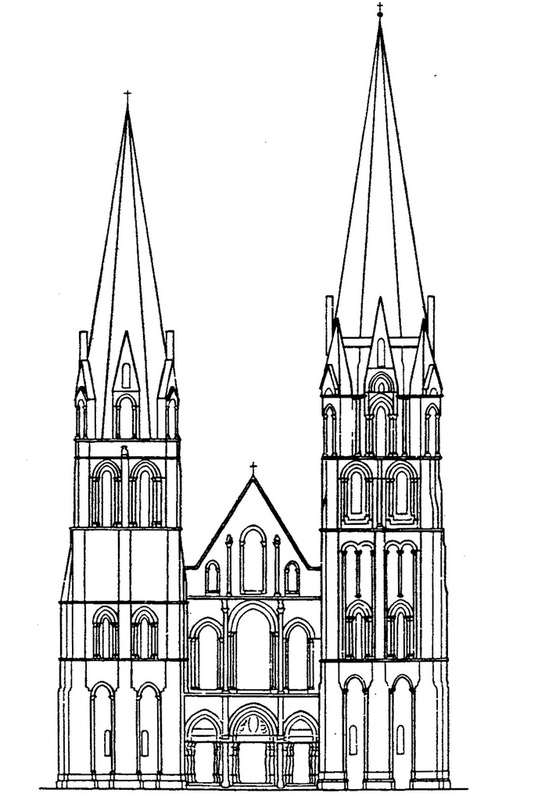 224 – A reconstruction of the west facade of the Chartres Cathedral as it was originally designed around 1145 and before the fire of 1194. The rose window is still missing and added after 1200. A repetitive series of forms is inspired by the three-division and higher numbers, like five and seven. The four-division is notably missing. The Sens cathedral was built between ca 1145 and 1164. The design had a strong reminiscence to the Norman style. It used a sexpartite vault, which was invented in Caen (the Saint-Etienne, ca 1130 – 1135) and was never before used outside Normandy. BONY (1983; p. 100) noted that ‘the Sens Cathedral is the first Gothic building in which can be observed the systematic application of a simple numerical formula in the designing of a complex elevation’. Width was probably more important than the height in the first ‘wave’ of Gothic architecture (1140 – 1180). Height became a priority in the second wave (1180 – 1200) by making use of flying buttresses. It all culminated in the High Gothic (1200 – 1240), when the rose windows were ‘invented’. The following scheme is a compilation of various cathedrals in France and the surrounding countries grouped in time. The introduction of specific architectural features is indicated (fig. 225). Fig. 225 – The distribution in place and time of a selection of cathedrals in and outside France (mainly after BONY, 1983). The four-story elevation – indicated with an asterix (*) in fig. 225 – emerged in the choir of the Noyon cathedral, which was designed ca 1160. The main arcade, tribunes, triforium and clerestory windows marked a new dedication to the four-fold. The first appearance (of the four story idea) was an exceptional variation on a late Ottonian type of east end, in the short choir in the Essen Munster, ca 1039 – 1051. At the end of the eleventh century it was imported in the west of England following the Norman Conquest and adapted to vaulting and the thick Norman construction (Tewkesbury, begun ca 1090). The motive than passed from Bruges and Tournai to northern France and became assimi-lated in the new Gothic vocabulary. The four-story pattern was firmly set after 1160 in such buildings as the cathedrals of Arras and Laon. The multiplicity of stories opened the way to even greater heights. An original element, from the time of contemplative, tetradic thinking, was now put to good use in a dualistic approach to reach visible results. The same process holds, to a certain extent, for the (west) towers of the cathedrals (fig. 226). Fig. 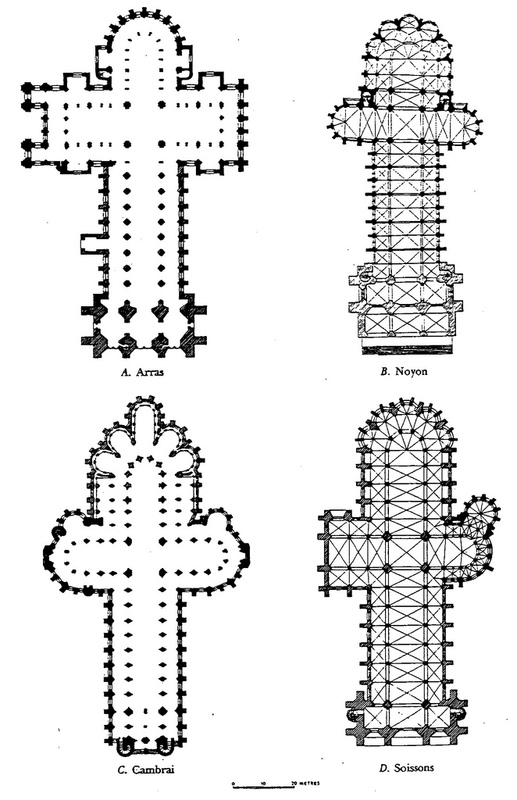 226 – Some plans of church towers, indicating that the Gothic tendency for greater heights found its roots in its Romanesque fore-bearers. Above: The foundations and level floor of the west-tower of Lesterps (Charente). Below: The foundations and level floor of the west-tower of Saint-Benoit-sur-Loire (Loiret). The Gothic builders wanted to show the individual elements in an all-embracing abundance. The genesis of the cathedral of Bourges – brilliantly analyzed by Robert BRANNER (1989) – is probably the best example of this development. It was in this largest building of its age that ‘the whole of twelfth-century Gothic was brought together and transfigured’ (BONY, 1983; p. 209) (fig. 227). Fig. 227 – The large Bourges Cathedral is a narrative book in its own right. The building has a complicated history, with rapidly changing insights and possibilities, added to natural setbacks like fires (Drawing: Marten Kuilman). The Amiens Cathedral was built just after the Bourges cathedral. The High Gothic reached here its most confident stage, applying the various notion of division in a free spirit. The western facade of the Amiens Cathedral exhibits a combination of different type of divisions. The triple entrance on the west face is composed of the four vertical lines, given rise to the two towers. The rose window symbolizes the unity in circularity (fig. 228). Fig. 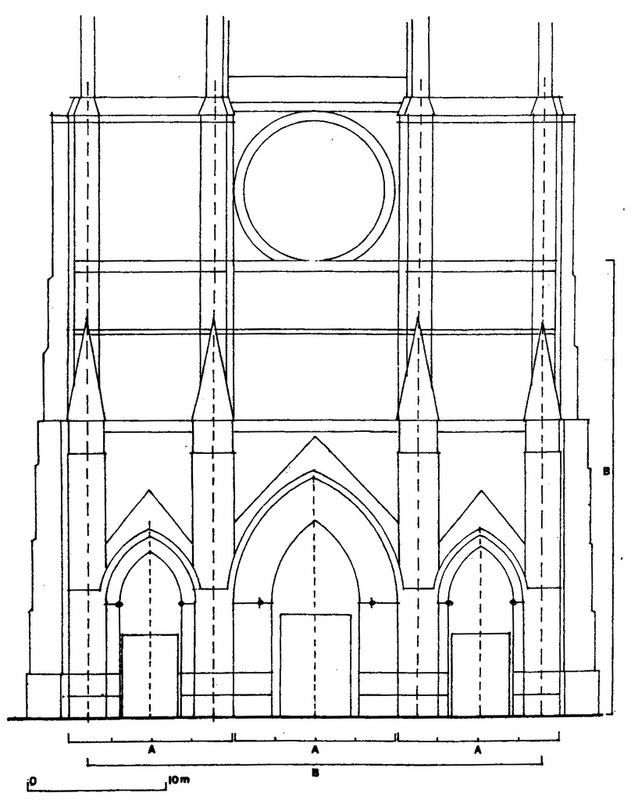 228 – The West facade of the Amiens cathedral is divided in modules, as proposed by Stephen MURRAY (2002). The Latin cross, used as a deliberate point of departure for the design of a church plan, deserves a much wider investigation then given here. The appearance of the transept and crossing (the ‘arms’ of the cross) in place and time should be a point of special interest. A first review seems to indicate that the Latin cross makes it mark in the Early Gothic, then became less important in the High Gothic and gathered strength again after the culmination of the High Gothic, in particular in the northern part of France. The plan of the (early) Pisa cathedral looked like that of an early Christian basilica, which developed into a Latin cross by the addition of the transepts (JANSON, 1962/1986; p. 287). 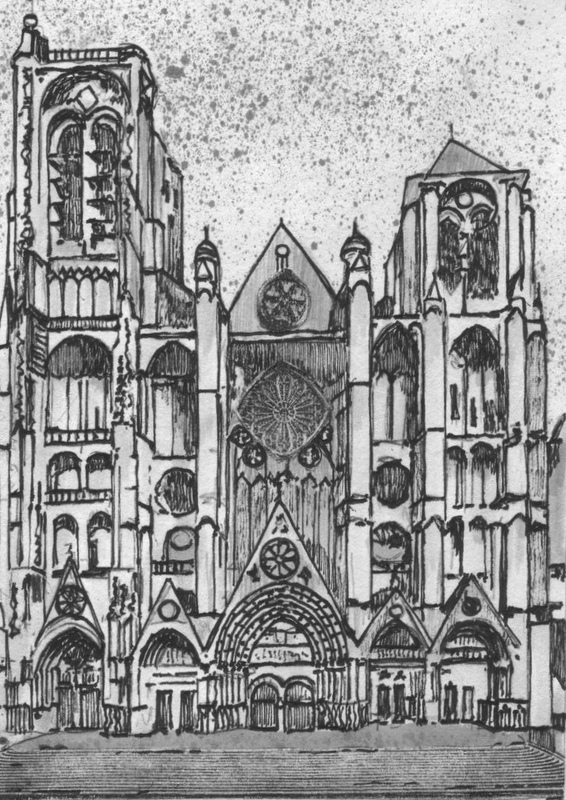 The graphic expression of the plan kept its importance up to 1200, with the Tournai cathedral (Belgium) as the most exhibitionist creation. The dominance of the feature can also be seen in the ground plans of the Northern Group of cathedrals in France (fig. 229). Fig. 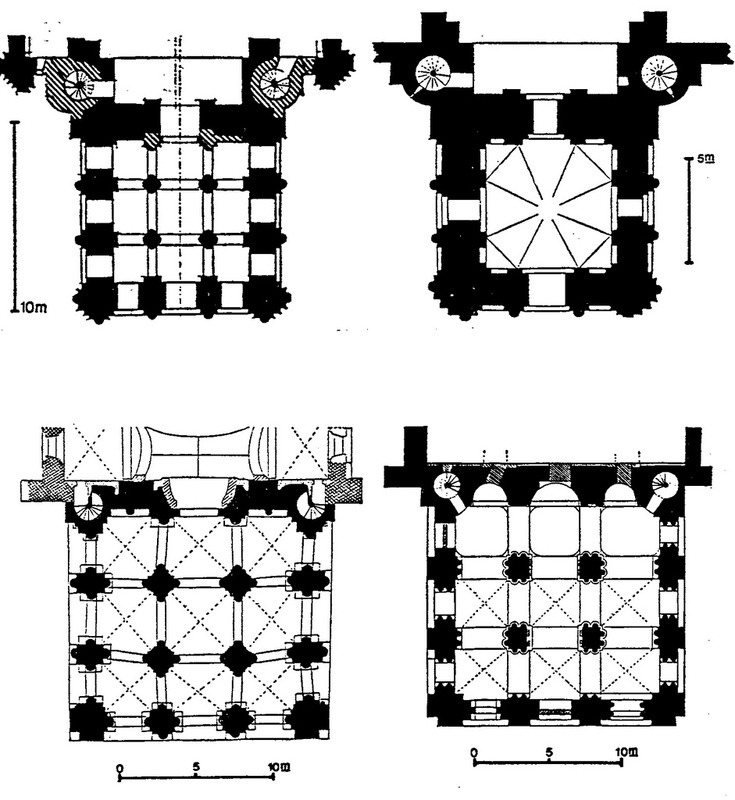 229 – Some ground plans of the Northern Group of cathedral in France (Arras, Noyon, Cambrai and Soissons) are examples of a deliberated planned layout based on the Latin cross (as given by BONY (1983, fig. 126). 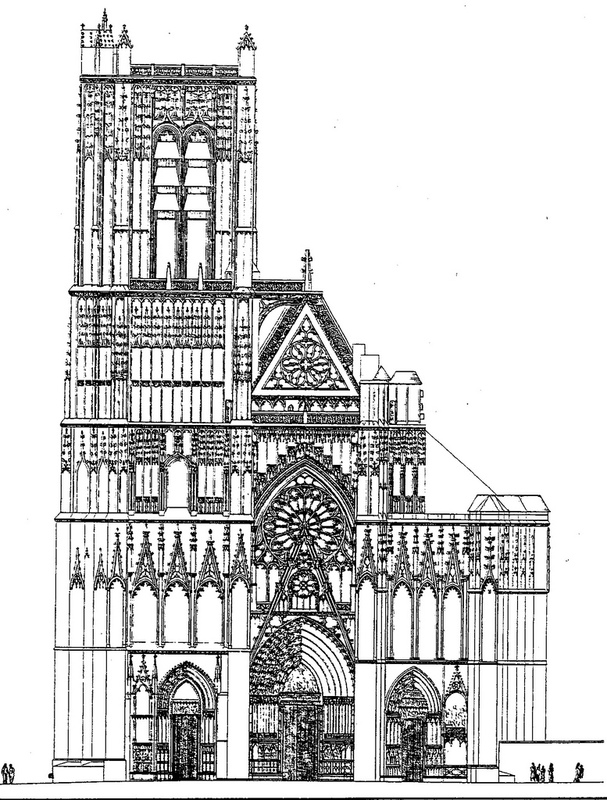 The High Gothic cathedrals of Amiens and Reims, on the other hand, put their emphasis on other architectural features and were not particularly concerned with a Latin cross ground plan – although some weak efforts to transepts are present. The cathedral of Bourges, as one of the last examples of twelfth century design, lacks the lateral extension altogether and each ambulatory has its own portal. The Beauvais cathedral, with its scattered history, was built between 1225 and 1272. 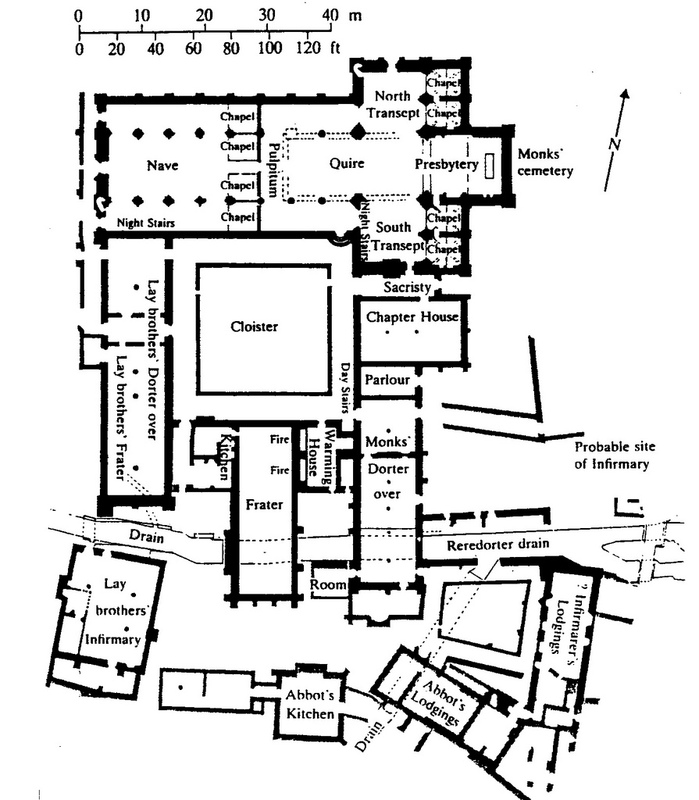 The ground plan saw a gradual return to the Latin Cross (with rose-windows in the transepts). However, the nave was never completed and the high vaults collapsed in 1284. The transept of the St. Denis in Paris was an addition of the mid-thirteenth century, built between 1231 and 1281.